In the early summer, the garlic mustard (Alliaria petiolata) goes to seed. That is a great time to do some invasive weed control while out foraging by gathering the large quantities of seeds the plant produces. 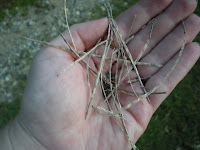 These seeds that drop now will over-winter and form the basal rosettes in the very early spring next year. 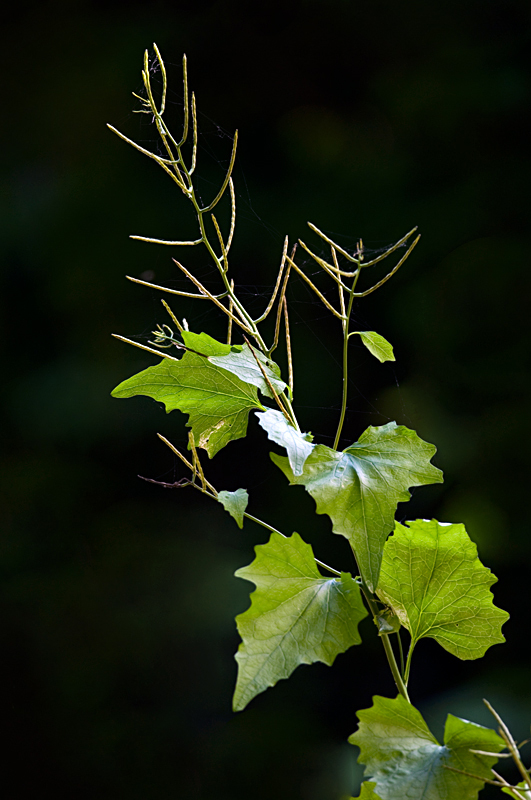 Garlic mustard will form dense clusters of plants, making it relatively easy to gather the seeds. Look for the light brown stalks, topped with skinny fingers that are the dry seed pods. The seeds are black, comma-shaped and about 1/8" long. 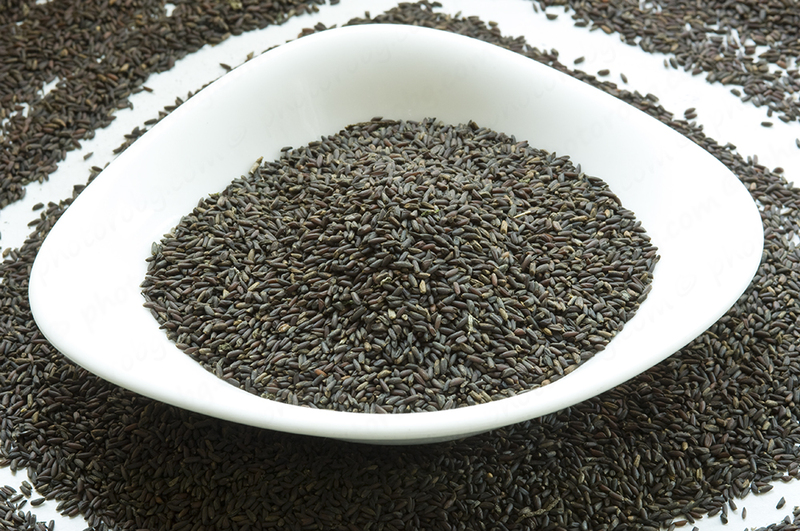 By pulling along the dry, brittle stems and along the seed pods, the seeds will fall into your hands or a waiting bucket. Many seeds will fall to the ground, but you should not feel like you are spreading the garlic mustard, since otherwise ALL of the seeds would have fallen to the ground and spread the plant naturally. If bits of the dry seed pods fall into the bucket, it is no problem. We take 2 large bowls or buckets, and pass the seeds between the two with a high pour to winnow out the much lighter seed pods, dust, and debris. Then we spread the mostly clean seeds on a sheetpan to dry further for a few days. We keep them stored in a glass jar to use for topping breads, adding to bagels, adding to curries like mustard seeds, to make mustard, and to make a dressing. 1. In a hot oven or over coals, roast the shallots or ramps bulbs until soft and charred. Cool. 2. Place the dijon or garlic mustard-mustard, diced lemon, and roasted shallots or ramps in a blender. Blend until smooth. 3. Add honey, cayenne, white pepper, salt, and pulse quickly. 4. Slowly pour in the oil with the blender on, and pour in the vinegar. Add the garlic mustard seeds with a final pulse. 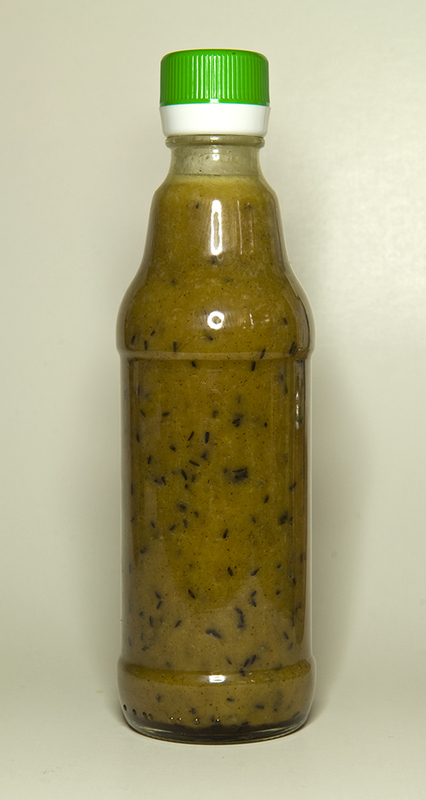 Store the dressing in the refrigerator, shaking before using. Looks delicious! Enjoying this invasive plant as food while at the same time controlling its spread is a great idea. I made garlic mustard pesto on the weekend for an community environmental stewardship workshop I lead here in Toronto, Ontario. You mention that "you should not feel like you are spreading the garlic mustard, since otherwise ALL of the seeds would have fallen to the ground and spread the plant naturally". Although it's true that by foraging the seeds one is removing seeds that would otherwise remain and propagate, by disturbing an infested area, seeds can spread to new areas, some of them very distant from their source, by getting lodged in the tread of ones shoe, nestling into ones clothing, by accidental spillage (of the container of gathered seeds) or by irresponsible transport. Enjoy the seeds, and the whole plant, but be sure to clean the bottom of your shoes or boots with a stiff boot brush (better: forage barefoot and "clean" your feet when leaving), check--and clean--your clothing when leaving the infested area, and once you've completed your seed gathering, securely seal the seed container.